Please support your local independent bookstores. They are the heart and soul of every community where they are located, and they are keeping good readers, good writers, and good books alive and well. 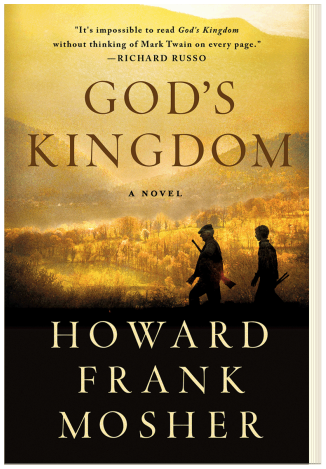 God’s Kingdom, Howard’s eleventh novel, will appear in paperback this coming fall. Set in northeastern Vermont in the 1950s, God’s Kingdom continues the story of the Kinneson family from Mosher’s bestselling A Stranger in the Kingdom (1989) through the coming of age of the heir to its rich and complicated history, Jim. Earnest and innocent, Jim is a bright student, loving son and brother, but also curious about the unspoken “trouble in the family” that haunts his father and grandfather. Layer by layer, tale by tale, sorting out fact from deliberately obscured legend, Jim explores the Kinnesons’ long relationship with others in the Kingdom, culminating in a discovery that forever changes his life and place in that world.